As summer approaches and warmer weather is just around the corner, you may want to get your wardrobe into shape. You'll be wearing a lot more sleeveless tops and dresses. Sometimes it's not the right setting to have your bra strap showing, so you may need a holder sewn inside. 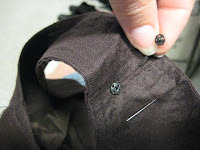 The snap part can go at either side of the strap, closer to the armhole or closer to the neckline. 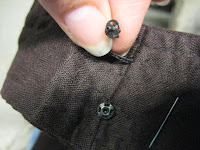 The male end of the snap is shown here attaching to the strap with a chain stitch that is about 3/4" long. It is sewn into the seam, then attached to the snap. The female end of the snap is attached directly to the strap. You can also buy ready made snap sets. They use ribbon in place of the chainstitched thread. Calison@ Adhesive Silicone Bra thanks for the information. A lot of women are going around with their bra strap showing. No class at all!Great investment!